Millennials are on the cusp of surpassing baby boomers as the largest generational demographic in the US, yet a startling plurality of them are woefully under prepared to assume the typical trappings of adulthood – like starting a family and buying a home. And in a detailed report published this week, analysts at ApartmentList illustrated just how wide of a gulf lies between millennials and their economic and financial goals. Perhaps the most surprising finding: Nearly half of millennial renters have zero money saved for a down payment – which doesn’t bode well for the housing market, where home prices have surpassed their pre-crisis highs (though signs of weakness are starting to emerge). And just 11% say they have $10,000 saved. To wit, 72% of millennial renters cite “affordability” as the biggest factor barring them from home ownership. Student debt is another factor: While 23% of college graduates might be able to scrape together enough for a down payment, that figure falls to 12% for those who are currently paying off student loans. But these aren’t the only factors holding millennials back from home ownership. A handful of macroeconomic trends are also to blame: Much of the generation came of age during or in the aftermath of the Great Recession, resulting in limited opportunities and stagnant wage growth in the crucial early stages of millennials’ careers. Construction of new single-family homes has lagged significantly in recent years, leading to a severe shortage of starter homes. And at the present average savings rate, most millennials will need more than two decades to save up enough for a down payment. Ironically, millennials with the highest incomes receive the most help from family for their down payments. And as we mentioned above, student-loan debt is one of the biggest obstacles absorbing all of the money that would otherwise be saved for a down payment. The upshot of this is that, instead of accumulating wealth in a home – which has always been the primary source of value for American families – millennials will continue throwing it away on rent, which offers them no return and no security later in life. This entry was posted in Housing, Housing Market and tagged First Time Homebuyer, Millennial on December 18, 2018 by Bone Fish. With its nation-leading murder rate, lake-effect weather, endemic corruption and financial mismanagement, who really wants to live in Chicago? Well, the data is in, and as Mayor Rahm Emmanuel prepares to hand power to a new administration next year, his legacy – already marred by the above-mentioned scourges – has accrued another ignominious distinction. According to Census data analyzed by Bloomberg, Chicago experienced the highest daily net migration in the US, losing 156 residents a day (strictly due to migration, not murder) a day in 2017. …some of America’s largest cities saw net outflows as rising rents, crumbling (or inadequate) public infrastructure. The city with the biggest outflow was NYC, followed by Los Angeles and – in third place – beautiful Bridgeport, Conn.
On the flip side, more than 208,000 residents left the New York City metropolitan area last year. This was nearly twice as many as the second biggest loser, Los Angeles, which had a decline of nearly 110,000. Chicago fell by 85,000. Honolulu, San Jose, New York and Bridgeport, CT lost the highest shares of their residents to other parts of the country. In Chicago, New York and Los Angeles, the three areas with a triple-digit daily exodus, people are fleeing at a greater rate than just a few years earlier. Soaring home prices and high local taxes are pushing local residents out and scaring off potential movers from other parts of the country. But maybe if Emmanuel’s successor can successfully implement the outgoing mayor’s plans for a city wide UBI (which we imagine would go a long way toward offsetting its hated ‘amusement tax’ and other levies needed to pay off the city’s brutal debt burden), maybe he can bribe residents into staying. This entry was posted in Economy, Housing and tagged chicago, demographics, Los Angeles, Migration, New York on December 17, 2018 by Bone Fish. I found the claim contrary to everything I think I know, so I thought I’d lay out the counter argument. The chart below shows annual growth of the 15+yr/old US population (blue columns) vs. the annual growth of the 15 to 64yr/old population (red balls). The 15+yr/old annual population growth has fallen 25% (decline of a half million annually) since the 1998 peak but more significantly, the 15 to 64yr/old annual population growth has fallen over 80% (decline of 1.8 million/yr) due to a combination of lower immigration rates and lower birth rates. These population growth trends will only continue to slow through 2030, according to UN and Census estimates (not really estimates, since this population is already born and simply advancing into adulthood). The future estimates for 15 to 64yr/old population growth (presented above) include estimated immigration well above present rates. Most, if not all (net) of the assumed 15 to 64yr/old minimal population growth is premised on ongoing immigration that continues slowing. Thus the forward looking 15 to 64yr/old growth estimates are likely to be lower and perhaps even turning to outright annual declines. The chart below shows average income, spending, and LFP (labor force participation) rates by age segment. No shocker, those actively working make and spend more than those with low rates of employment. Those who have worked longer earn more than those new to the labor force. Elderly expenditures come into very close alignment with their (generally) fixed incomes. Noteworthy is that 75+yr/olds have only an 8% LFP rate but will make up over half of the total 65+yr/old population growth through 2030. The next largest growth segment is among 70 to 74yr/olds with a 19% LFP rate, and the smallest increase is among the 65 to 69yr/olds with a 32% LFP. As an aside, 65+ year olds have the highest home ownership rates at 78% vs. 36% for those aged 15 to 34. So while the more affluent portion (5% to 20%?) of 65+yr/olds may be interested in a second home in the desert, the mountains, or beach…the majority already own and are eventually looking to downsize. Simply stated, nearly all the coming growth is among those that work the least, earn the least, spend the least, already own homes, and are more likely to downsize than buy a second home. Putting it all together (chart below), annual 15+yr/old total population growth (blue columns), 15 to 64yr/old population growth (red line), housing starts (yellow line), and federal funds rate (black line). Given it is the 15 to 64yr/old population that does the net home buying, (and growth among them continues decelerating…coupled with rising rates and elevated valuations versus most population growth among 75+yr/olds who are more likely to sell via downsizing and/or willing properties to their heirs) I contend the US is creating too many homes presently, not too few. Of course, this doesn’t even factor in things like the lack of income growth among the vast majority those working, high student debt loads, slowing household formation, continued delayed family formation and the lowest birth rates in US history which were just recorded in the first quarter of 2018 (according to CDC…HERE), etc. etc. Contrary to the author of the article that inspired me, I contend that housing is in for another very rough decade (at the very least)… likely worse than the period during the GFC. The math is pretty straightforward on this one. This entry was posted in Housing, Housing Market and tagged housing market on November 15, 2018 by Bone Fish. This is how housing markets turn. Slowly, then all at once. Seven years of Seattle home prices outpacing wage growth because of low rates; bidding wars replaced by sales at the asking price; days or weeks on the market turning into months; sellers reduce home prices; surging mortgage rates; buyers disappear, and wallah – a classic turning point in an auction, otherwise known as an unfair high that is now rippling through the real estate food chain in the Seattle area. With that in mind, it comes as no surprise that inventory countywide soared 86% among single-family homes and 188% among condos in October compared to a year prior, according to newly published data by the Northwest Multiple Listing Service. It was the most massive year-over-year increase on record, dating back to the Dotcom bust, a rhythm that has some asking: Is the housing industry about to go bust? Mike Rosenberg, a Seattle Times real estate reporter, has been documenting the rise and fall of the real estate market on the West Coast. Rosenberg said the median home price plummeted to $750,000, down $25,000 in one month and down $80,000 from all-time highs in spring. Compared to 2017, prices inched up about 2%. He said interest rates had moved higher in that span have increased monthly mortgage costs. On the Eastside, the median home sold for $890,000, unchanged from the previous month, but down $87,000 from the all-time high in late summer. On a year-over-year basis, prices were still up 5.3%. Rosenberg notes that prices dipped on a month-over-month basis in South King County but surged at the northern end of the county. He said inventory is flooding the market at the same time as buyer demand evaporates. As we highlighted in the BofA report, sellers across the country are unloading properties into a weakening market will trigger downward momentum in prices. Back to Seattle, that is precisely what is happening, as sellers have reacted by cutting asks faster than any other metro area in the country. To make matters worse, buyers are now negotiating prices down even further, as the average home is selling for below list price for the first time in four years, said Rosenberg. Rising interest rates, declining demand, and flat-lining rents have been the main drivers of failing home buyer demand in the second half of 2018. Into the fall months, brokers told Rosenberg that buyers are now pausing as they wait for the storm to blow over. Ken Graff, a broker with Coldwell Banker Bain in Seattle, listed a townhouse in Magnolia on the market in April, “right before the apparent peak of the market,” and had 11 bidders who ferociously fought for the home, with a winning bid for $800,000. In September, he listed an identical town home in the same neighborhood, it stood on the market for three weeks before selling for $725,000. “Buyers are still having to pay a premium for Seattle-area properties, but it lacks the frenzy we’ve seen in the last few years,” Graff said. Among other regions where home prices have dropped in October on a year-over-year basis: West Bellevue, Southeast Seattle, Burien-Normandy Park, and the Skyway area. On the other end, prices rose more than 10% from a year ago in Jovita-West Hill Auburn, Auburn, Kent, Renton-Benson Hill, Mercer Island, Kirkland-Bridle Trails and Juanita-Woodinville. Elsewhere, the rest of the Puget Sound region also saw expanding inventory, including a 65% increase in Snohomish County. The slowdown in Seattle housing shows little signs of abating as the Federal Reserve is expected to hold rates on Thursday before a hike in December. At their most recent meeting in late September, Fed officials communicated a plan for three more hikes in 2019. With one more rate hike forecasted in 2018 and three more in 2019, it seems that Seattle and much of the country’s real estate market could be at a significant turning point into the 2020 presidential elections. Let us hope real estate prices do not fall even further, as many home buyers could vote with their home prices. This entry was posted in Housing, Housing Market and tagged Seattle on November 8, 2018 by Bone Fish. After five years of supporting rising home prices, the latest phase of a long-term financial cycle is nearing its end. While little followed in the real estate market, this cycle of yield curve spread compression has been one of the largest determinants of home affordability and housing prices. Using a detailed analysis of national statistics, it is demonstrated that average home buyers in 2018 have been saving about $250 per month, or $3,000 per year. The reasons why the cycle is ending are mathematically and visually demonstrated. (Daniel Amerian) Home buyers in every city and state have been benefiting from a powerful financial cycle for almost five years. Most people are not aware of this cycle, but it has lowered the average monthly mortgage payment for home buyers on a national basis by about $250 per month since the end of 2013. The interest rate cycle in question is one of “yield curve spread” expansion and compression, with yield curve spreads being the difference between long-term and short-term interest rates. This interest rate spread has been going through a compression phase in its ongoing cycle, meaning that the gap between long-term interest rates and short-term interest rates fell sharply in recent years. The green bars in the graph above show national average mortgage payments (principal and interest only), and they fell from $861 a month in 2013 to $809 a month in 2016 and have now risen to $894 per month. However, without the narrowing of the spread between short-term rates and long-term rates, mortgage payments would have been entirely different (and likely home prices as well). Without the cycle of yield curve spread compression then, as shown with the blue bars, average mortgage payments would have been above $900 per month even in 2014, and they would have risen every year since without exception. If it had not been for compression, national average mortgage payments would have reached $978 per month in 2016 (instead of $809) and then $1,138 per month in 2018 (instead of $894). The yellow bars show the average monthly savings for everyone buying a home during the years from 2014 to 2018. The monthly reduction in mortgage payments has risen from $57 per month in 2014 to $169 per month in 2016, to $244 per month by 2018 (through the week of October 11th). In other words, the average home buyer in the U.S. in 2018 is saving almost $3,000 per year in mortgage payments because of this little-known cycle, even if they’ve never heard of the term “yield curve.” Indeed, while the particulars vary by location, home affordability, home prices and disposable household income have been powerfully impacted in each of the years shown by this interest rate cycle, in every city and neighborhood across the nation. While knowledge of this cyclical cash flow engine has not been necessary for home buyers (and sellers) to enjoy these benefits in previous years, an issue has developed over the course of 2018 – the “fuel” available to power the engine has almost run out. That means that mortgage payments, home affordability and housing prices could be traveling a quite different path in the months and years ahead. The yield curve spread is shown in the blue area above, and it was quite wide at the beginning of this particular cycle, equaling 2.62% as of the beginning of 2014. It has been steadily used up since that time, however, with the compression of the spread being shown in red. As of the current time, the yield curve compression which has powered the reduction in mortgage payments has almost maxed out, the blue area is almost gone and the ability to further compress (absent an inversion) is almost over. This analysis is part of a series of related analyses; an overview of the rest of the series is linked here. A yield curve spread is the difference in yields between short-term and long-term investments, and the most common yield curve measure the markets looks to is the difference between the 2-year and 10-year U.S. Treasury yields. An introduction to what yield curves are and why they matter can be found in the analysis “A Remarkably Accurate Warning Indicator For Economic And Market Perils.” As can be seen in the graph below and as is explored in more detail in some of the linked analyses, there is a very long history of yield curve spreads expanding and compressing as part of the overall business cycle of economic expansions and recessions, as well as the related Federal Reserve cycles of increasing and decreasing interest rates. Since the beginning of 2014, the rapid shrinkage of the blue area shows the current compression cycle, and a resemblance (in broad strokes) can be seen with the compression cycles of 1992-2000 and of 2003-2006. 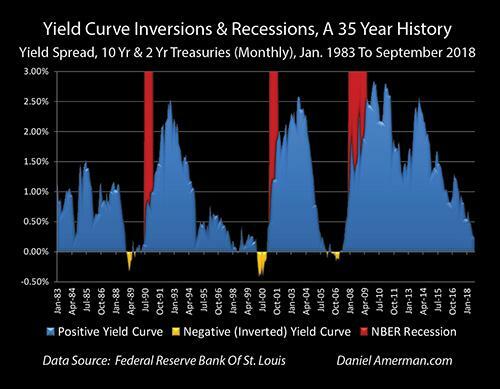 What has seized the attention of the markets in recent months is what followed next in some previous cycles, which is that yield curve spreads went to zero and then became negative, creating “inversions” where short-term yields are higher than long-term yields (as shown in the golden areas). This is important because, while such inversions are quite uncommon, when they do occur they have had a perfect record in recent decades (over the last 35 years) of being followed by economic recessions within about 1-2 years. However, yield curves don’t have to actually invert in order to turn the markets upside down, and as explored in the analysis linked here, when the Fed goes through cycles of increasing interest rates, we have a long-term history of yield curve spreads acting as a counter cyclical “shock absorber” and shielding long-term interest rates and bond prices from the Fed actions. That only works until the “shock absorber” is used up, however, and as of the end of the third quarter of 2018, the yield curve “shock absorber” has been almost entirely used up. So, when the Fed increased short-term rates in late September of 2018, there was almost no buffer, and that increase passed straight through to 10-year Treasury yields. The results were painful for bond prices, stock prices and even the value of emerging market currencies. The same lack of compression led to a sudden and sharp leap to the highest mortgage rates in seven years. Unfortunately, that jump may also potentially be just a taste of what could be on the way, with little further room for the yield curve to compress (without inverting). 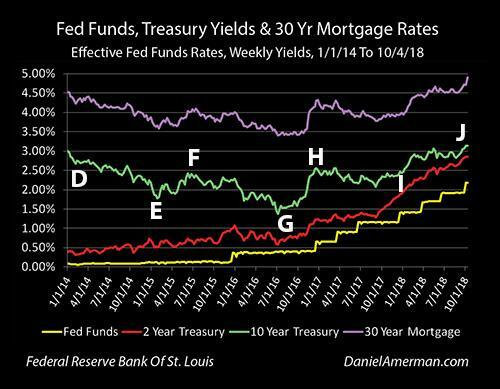 The graphic below shows weekly yields for Fed Funds, 2-year Treasuries, 10-year Treasuries and 30-year fixed-rate mortgages since the beginning of 2014. The first relationship is the visually obvious close correlation between the top purple line of mortgage rates and the green line of 10-year Treasury yields. Mortgage amortization and prepayments mean that most mortgage principal is returned to investors well before the 30-year term of the mortgage, and therefore, investors typically price those mortgage rates at a spread (the distance between the green and purple lines) above 10-year Treasury yields. It isn’t a perfect relationship – the 10-year Treasury tends to be a bit more volatile – but is a close one. The bottom two lines are the short-term yields, with the yellow line being effective overnight Fed Funds rates, and the red line being 2-year Treasury yields. Because the yield curve has been positive over the entire time period shown (as it almost always is), long-term rates have consistently been higher than short-term rates, and 10-year Treasury yields have been higher than 2-year Treasury yields, which have been higher than Fed Funds rates. Now, the long-term rates have been moving together, and while the relationship is not quite as close, the short-term rates have also been generally moving together, with the 2-year Treasury yield more or less moving up with the Fed’s cycle of increasing interest rates (each “step” in the yellow staircase is another 0.25% increase in interest rates by the Federal Reserve). However, the long-term rates have not been moving with the short-term rates. As can be seen with point “D,” 10-year Treasury yields were 3.01% at the beginning of 2014, 2-year Treasury yields were a mere 0.39% and the yield curve spread – the difference between the yields – was a very wide 2.62%. About a year later, by late January of 2015 (point “E”), 10-year Treasury yields had fallen to 1.77%, while 2-year Treasury yields had climbed to 0.51%. The yield curve spread – the distance between the green and red lines – had narrowed to only 1.26%, or a little less than half of the previous 2.62% spread. It can be a little hard to accurately track the relative distance between two lines that are each continually changing, so the graphic below shows just that distance. The top of the blue area is the yield curve spread; it begins at 2.62% at point “D” and falls to 1.26% by point “E.” The great reduction between points “D” and “E” is now visually obvious. So, if there had been no change in yield curve spreads, and the 2-year Treasury had risen to 0.51% while the spread remained constant at 2.62%, then the 10-year Treasury yields would have had to have moved to 3.13%. 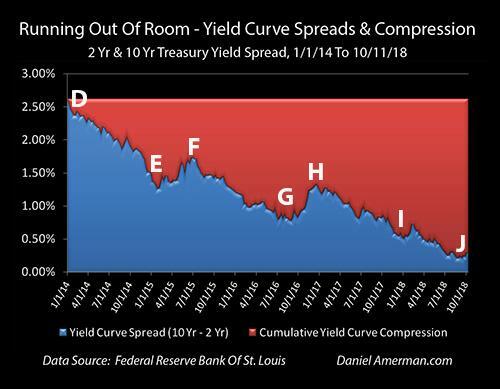 But they didn’t – the yield curve compressed by 1.36% (2.62% – 1.26%) between points “D” and “E,” and the compression can be seen in the growing size of the red area labeled “Cumulative Yield Curve Compression.” If we start with a 2.62% interest rate spread, and that spread falls to 1.26% (the blue area), then we have used up 1.36% (the red area) of the starting spread and it is no longer available for us. The top of the green area is the national average 30-year mortgage rate as reported weekly by Freddie Mac. That rate fell from 4.53% in the beginning of 2014 (point “D”) to 3.66% in late January of 2015. But remember the tight relationship between the green and purple lines in the graph of all four yields / rates. 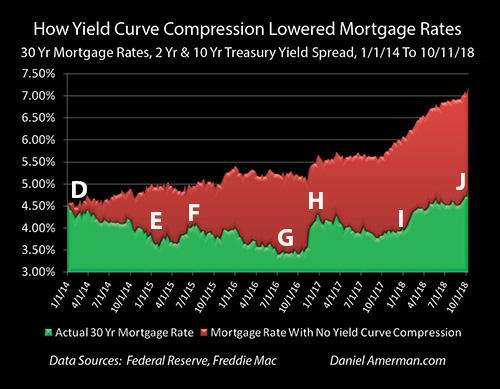 Mortgage investors demand a spread above the 10-year Treasury, mortgage lenders will only lend at rates that will enable them to meet that spread requirement (and sell the mortgages), and therefore, it was the reduction in 10-year Treasury yields that drove the reduction in mortgage rates. And if the yield curve compression had not occurred, then neither would have the major reduction in mortgage rates. As we saw in the “Running Out Of Room” graphic, the red area of yield curve compression increased by 1.36% between points “D” and “E.” If we simply take the red area of yield curve compression from that graph and we add it to the green area of actual mortgage rates, then we get what mortgage rates would have been with no yield curve compression (all else being equal). With no yield curve compression, mortgage rates of 3.66% at point “E” would have been 5.02% instead (3.66% + 1.36% – 5.02%). At a 5.02% mortgage rate – which is what it would have been with no yield curve compression – the payment would have been $951. This meant that for any given size mortgage, monthly payments were reduced by 15% over the time period as a result of yield curve spread compression ($810 / $951 = 85%). Now, at that time, housing prices were still in a somewhat fragile position. The largest decrease in home prices in modern history had just taken place between the peak year of 2006 and the floor years of 2011-2012. Nationally, average home prices had recovered by 9.5% in 2013, and then another 6.4% in 2014. Here is a question to consider: Would housing prices have risen by 6.4% in 2014 if mortgage rates had not reduced monthly mortgage payments by 15%? Our next key period to look at is between points “E” and “G,” late January of 2015 to late August of 2016. We are now beginning a rising interest rate cycle when it comes to short-term rates. The Fed had done its first slow and tentative 0.25% increase in Fed Funds rates, and 2-year Treasury yields were up to 0.80%, which was a 0.29% increase. However, that isn’t what happened. After a brief jump upwards at point “F,” yield curve spreads had substantially fallen to 0.78% by point “G,” as can be seen in the reduction of the blue area above. For this to happen, the compression of yield curve spreads had to materially increase to 1.84%, as can be seen in the growth of the red area. In the early stages of a cycle of rising interest rates (as part of the larger cycle of exiting the containment of crisis), mortgage rates did not rise, but fell from the very low level of 3.66% at point “E” to an even lower level of 3.46% at point “G,” as can be seen in the reduction of the green area. To get that reduction in the green area during a rising interest rate cycle required a major growth in the red area of yield curve compression. To see what mortgage rates would have been without yield curve compression (all else being equal), we add the red area of cumulative yield curve compression of 1.84% to the green area of actual mortgage rates of 3.46% and find that mortgage rates would have been 5.30%. Returning to our $176,766 mortgage example, the monthly mortgage payment (P&I only) is $790 with a 3.46% mortgage rate, and is $982 with a 5.30% mortgage rate. 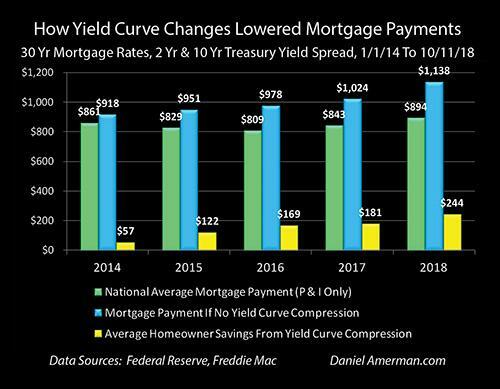 Yield curve compression was responsible for a 20% reduction in mortgage payments for any given borrowing amount by late August of 2016. 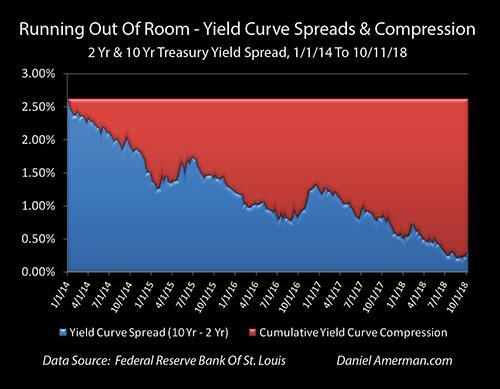 However, a problem is that by late August of 2016, the 1.84% cumulative cyclical compression of the yield curve meant that only 0.78% of yield curve spreads remained. A full 70% of the initial yield curve spread had been used up. After its slow and tentative start, the Federal Reserve returned to 0.25% Fed Funds rate increases in December of 2016, and has kept up a much steadier pace since that time. As of October of 2018, Fed Funds rates are now up a total of 2% from their floor. As can be seen in the line graph of the yield curve over time, 2-year Treasury yields have also been steadily climbing and were up to 2.85% by point “J,” the week ending October 11th. However, 10-year Treasury yields are not up by nearly that amount. By late August of 2018, 10-year Treasury yields were only up to 2.87%, which was 1.29% above where they had been two years before. The difference can be found by looking at the very small amount of blue area left by point “J” – yield curve spreads were down to a mere 0.22% by the week ending August 29th, or less than one 0.25% Fed Funds rate increase. This meant that the red area of total cumulative yield curve compression was up to 2.40%, which means that 92% of the “fuel” that had been driving the compression profit engine had been used up – before the Fed’s 0.25% Fed Funds rate increase of September 2018. As explored in much more detail in the previous analysis linked here, when the Federal Reserve raised rates for the eighth time in September, the yield curve did not compress. Such a compression could have been problematic, as the yield curve would have been right on the very edge of inverting, and there is that troubling history when it comes to yield curve inversions being such an accurate warning signal of coming recessions. Instead, the short-term Fed Funds rate increase went straight through to the long-term 10-year Treasury yields, full force, with no buffering or mitigation of the rate increase by yield curve compression. The resulting shock as the 10-year Treasury yield leaped to 3.22% led to sharp losses in bonds, stocks and even emerging market currencies. The same shock also passed through in mostly un-buffered form to the mortgage market via the demand for mortgage investors to be able to buy mortgages at a spread above the 10-year Treasury bond. Thirty-year mortgage rates leaped from 4.71% to 4.90%, an increase of 0.19%, and the highest rate seen in more than seven years. When we look at the period between points “G” and “J,” it looks quite different than either of the previous periods we looked at. Mortgage rates have been rising, with the largest spike occurring at the time that the Federal Reserve proved it was serious about actually materially increasing interest rates with the Fed Funds rate increase of December 2016 (point “H”). However, this does not mean that the money saving power of yield curve compression had lost its potency. Between points “D” and “J,” early January of 2014 and early October of 2018, average annual mortgage rates rose from 4.53% to 4.90%, as can be seen in the green area – which is an increase of only 0.37%. Meanwhile, the yield curve spread between the 2- and 10-year Treasuries was compressing from 2.62% to 0.29%, which was a yield curve compression of 2.33%. Adding the red area of cumulative yield curve compression to the green area of actual mortgage rates shows that current mortgage rates would be 7.23% if there had been no yield curve compression (all else being equal). Mortgage principal and interest payments on a 30-year $176,766 mortgage with 4.90% interest rate are $938 per month, and they are $1,203 per month with a 7.23% mortgage rate. This means that yield curve compression has reduced the national average mortgage payment by about 22%. This particular analysis is a specialized “outtake” from the much more comprehensive foundation built in the Five Graphs series linked here, which explores the cycles that have created a very different real estate market over the past twenty or so years. As developed in that series, as part of the #1 cycle of the containment of crisis, the attempts to cure the financial and economic damage resulting from the collapse of the tech stock bubble and the resulting recession, the Federal Reserve pushed Fed Funds rates down into an outlier range (shown in gold), the lowest rates seen in almost 50 years. As part of the #3 cycle of the containment of crisis, in the attempt to overcome the financial and economic damage from the Financial Crisis of 2008 and the resulting Great Recession, the Federal Reserve pushed interest rates even further into the golden outlier range, with near-zero percent Fed Funds rates that were the lowest in history. 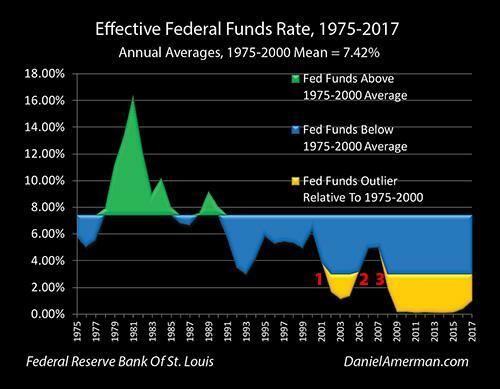 By the time we reach early January of 2014 to late January of 2015, points “D” to “E,” Fed Funds rates were still where they had been the previous five to six years – near zero. Mathematically, there was no room to reduce interest rates, without the U.S. going to negative nominal interest rates. But yet, mortgage rates fell sharply, from an already low 4.53% to an extraordinarily low 3.66%. This sharp reduction in rates transformed the housing markets and would steer extraordinary profits to homeowners and investors over the years that followed. However, none of it would have been possible without the compression of yield curve spreads. Once the past has already happened, it is easy to not only take it for granted, but to internalize it and to make it the pattern that we believe is right and natural. Once this happens, the next natural step is to then either explicitly or implicitly project this assumed reality forward, as that trend line then becomes the basis for our financial and investment decisions. However, where this natural process can run into difficulties is when what made the past possible becomes impossible. Yield curve spread compression took what would have been impossible – a plunge in mortgage rates even as short-term rates remained near a floor – and made it possible. But that pattern can’t repeat (at least not in that manner) when there is no longer the spread to compress. This entry was posted in Housing, Housing Market and tagged affordable housing, interest rates on November 5, 2018 by Bone Fish. Amid the collapse on US home sales, as mortgage rates surge above 5.00%, August’s Case-Shiller home price data plunged to its weakest annual growth since Dec 2016, dramatically missing expectations). On a non-seasonally-adjusted basis, home prices rose 5.77%, down from 5.99%, the lowest since June 2017. Is it any surprise that home builder stocks have collapsed along with US housing data? This entry was posted in Housing, Housing Market and tagged Home Prices, housing market, Seattle on October 30, 2018 by Bone Fish. In the second quarter of 2017, median asking rents jumped 5% from $864 to $910. In the first half of 2018, they have remained at levels crushing the American worker. While the surge in median asking rents has triggered an affordability crisis, new data now shows just how much a person must make per month to afford rent. According to HowMuch.Net, an American should budget 25% to 30% of monthly income for rent, but as shown by the New Deal Democrat, workers are budgeting about 50% more of their salaries than a decade earlier. The report specifically looked at the nation’s capital, where a person must make approximately $8,500 per month to afford rent. In California, the state with the largest housing bubble, the monthly income to afford rent is roughly $8,300, followed by Hawaii at $7,800 and New York at $7,220. In contrast, the Rust Belt and the Southeastern region of the United States, one needs to make only $3,500 per month to afford rent. “Based on the rule of applying no more than one-third of income to housing, people living in the Northeast must earn at least twice as much as those living in the South just to afford rent for what each market considers an average home,” HowMuch.net’s Raul Amoros told MarketWatch. In short: the situation is not likely to improve in the short-term. A sign of relief could be coming in the second half of 2019 or entering into 2020 when the US economy is expected to enter a slowdown, if not outright recession. This would reverse the real estate market, thus providing a turning point in rents that would give renters relief after a near decade of overinflated prices. This entry was posted in Housing and tagged high rent, Rent on October 28, 2018 by Bone Fish.